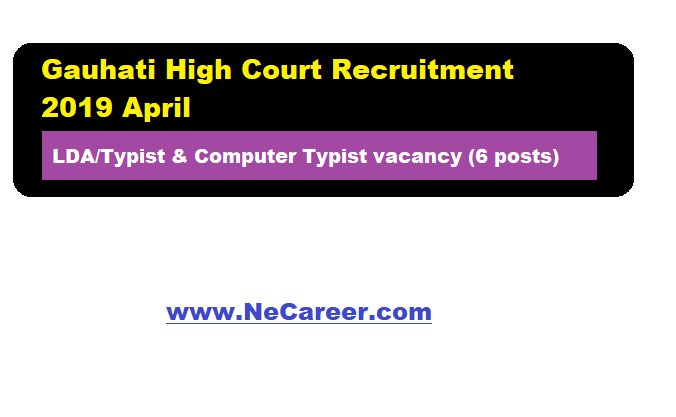 Gauhati High Court Recruitment 2019 April - LDA/Typist & Computer Typist vacancy (6 posts):- Welcome to North East India's No. 1 Job Portal NeCareer.com . Assam Guwahati High Court has issued a job notification in April 2019. According to the recruitment,Online applications are invited at Gauhati High Court from the citizens of India as defined under Article 5 and 6 of the Constitution of India for filling up the vacant posts of L.D. Assistant/LDA/Typist and Computer Typist for the district courts of Assam. (a) A candidate must be a Graduate in any stream from a UGC recognized University as on the last date of submission of application. (b) He/ She must have working knowledge of computer. (c) The candidate should have knowledge of the Official Language of the State of Assam (Assamese). (b) He/ She must have Diploma/Certificate in MS office from any Govt./ Private institute. PWD (Person with disability) category candidates need not to pay any fee. For SC/ST : Rs. 150/- and For all others: Rs. 300/- need to be paid while applying to the posts. For LDA/LD Assistant/Typist there will be 2 stages of Selection process. Qualifying Marks of Assamese will be 8 Marks. Final selection will be based on grand total marks of written test and Viva Voce. For Computer Typist there will be 2 stages of Selection process. Final selection will be based on grand total marks of written test,Computer Skill Test and Viva Voce. Eligible and Interested candidates who want to apply for Gauhati high court recruitment can submit online application forms wich is available at the home page of the website www.ghconline.gov.in wherein a scroll under the caption 'Click here to apply online’ will be available. 3) Last date for payment of fees: 13-05-2019 till bank transaction hours. 1) Number of posts may vary at the time of final selection. 2)No person, who has entered into or contracted a marriage with a person having a spouse living or who, having a spouse living, has entered into or contracted a marriage with any person, shall be eligible for appointment to the aforementioned posts. 3)The admission of candidates at all stages of the selection process shall be purely provisional and subject to theft satisfying the prescribed eligibility criteria. If, on verification at any time before or after the selection process, it is found that a candidate does not fulfill any of the eligibility conditions, his/her candidature shall stand cancelled without any notice. Mere calling of candidate to written examination/skill test/interview etc. or issuance of admits card/call letter etc. does not mean acceptance of candidature of any candidate which shall be further scrutinized at every stage and the High Court reserves the right to reject the candidature of any candidate at any time.